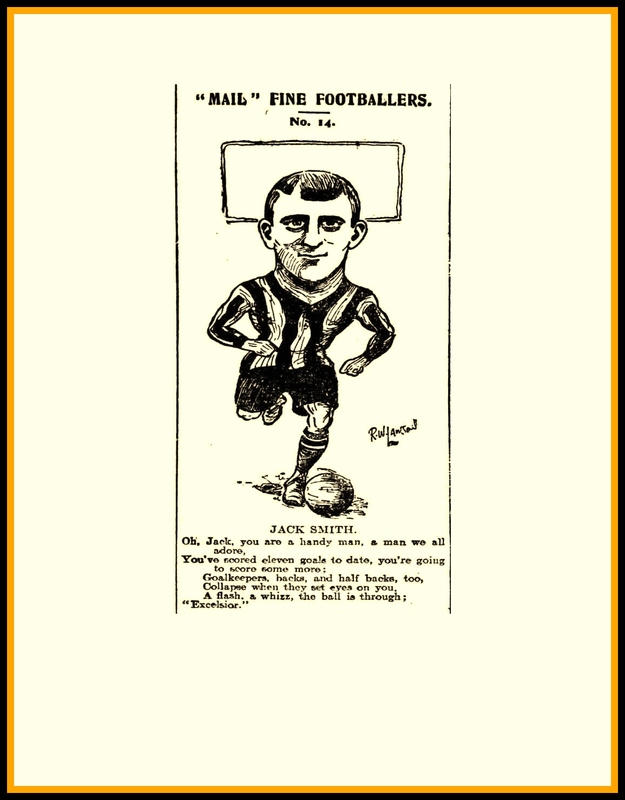 In mid-October I wrote a piece on unsung Hull City and English footballing hero John ‘Jackie’ Smith, which can be found here. Since then, the family of the Hull City legend have been kind enough to get in touch and send us some fascinating images. 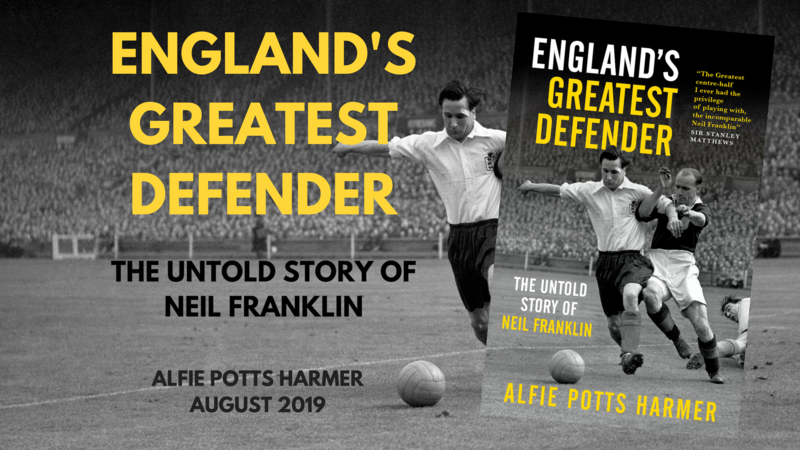 With that, I am delighted to say we have AHTR exclusive featuring previously unpublished photograph’s taken whilst Jackie Smith played for the club, making them some of the oldest in the club’s history. We would like to thank Jackie’s great-grandson for getting in touch and congratulate him on his marvellous family history. Date – Unknown. Jackie Smith is fifth from the left on the front row. 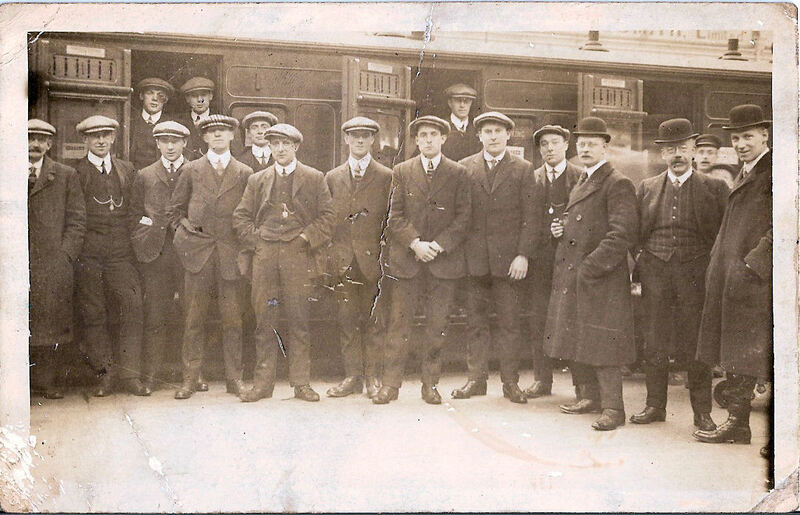 This picture was taken at Paragon Station as the Hull City team boarded a train heading to an away fixture. As you can see at the foot of the photograph, this shot was taken in February 1908. 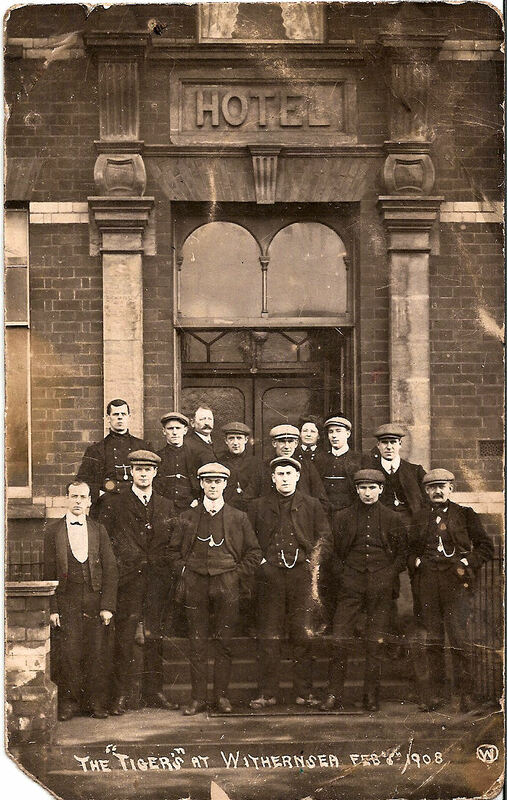 Here the Hull City players are gathered outside the Queens Hotel in Withernsea, known to be a regular haunt of the team during this era. This particular photograph was taken as the players prepared for a big game against Leeds City, who dissolved in 1919 paving the way for Leeds United to be created and join the Football League. Collapse when they set eyes on you. Date – 1907. The only known/surviving photograph of Jackie Smith in action, the prolific forward can be seen chasing the ball in the foreground of the photograph. 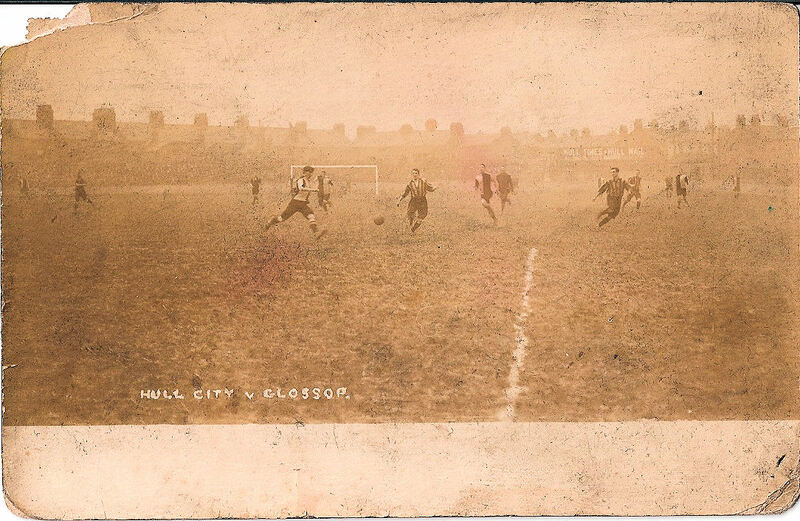 Taken during a 1907 Second Division game between Hull City and Glossop North End, it is unknown whether the image is from the 1906/07 tie or the 1907/08 tie. Date – Unknown. 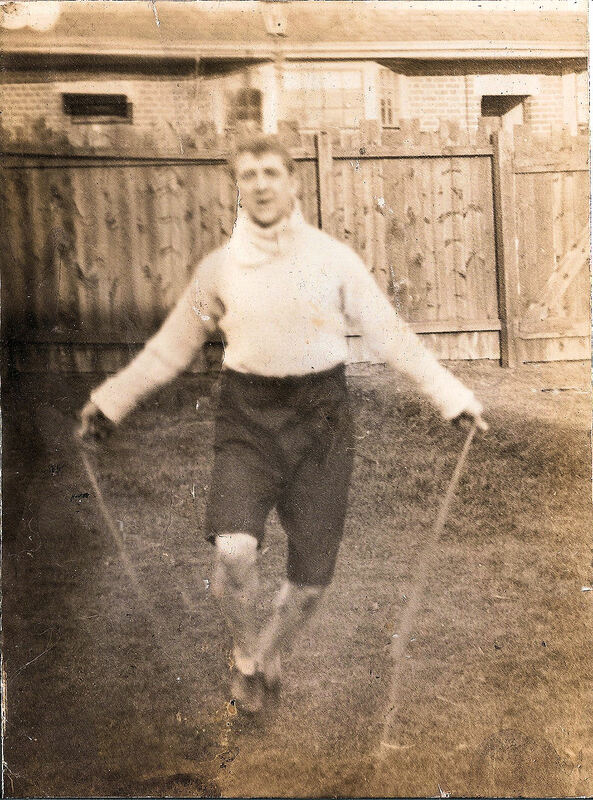 A rather blurry photograph of Smith training with a skipping rope. It is the only individual photo of Jackie that we have. 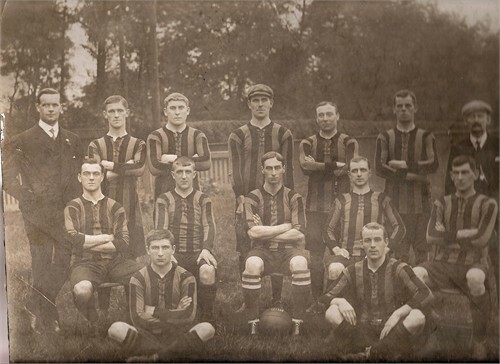 A rare and very early team photo, this shot was taken ahead of the 1907/08 season, only Hull City’s third campaign as a member of the Football League. The Tigers went on to finish in eighth place that season. I reckon that postcard of the Glossop game shows the match at the Boulevard (with its built-up housing) on March 10th 1906 in which Jackie played as centre-forward in the 2-1 home defeat. Two weeks later City played their first game at their own Anlaby Road ground. Fantastic post, thats the only photo I’ve ever seen of City playing at The Boulevard. Or is iit Feb 9th 1907 when City played Glossop at the Boulevard (the only time they played there after leaving it in March 1906)? I’m guessing Anlaby Road & the Circle were frozen so we had no choice but to play on the Boulevard (in the final year of our 3 year rental agreement). If OK I have shared the match pic to commemorate Jackie Smith on Hull City Fan’s Forum group for Remembrance Sunday.